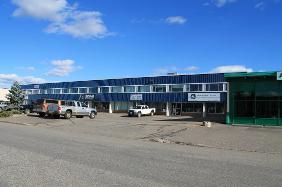 You need a light industrial space for your Prince George business with good traffic, but you also need a place that's affordable. At Majestic, we understand that and we can help you find what you need-a space that is affordable, with flexible lease terms. We specialize in great locations! Great professional building with lots of windows. 2,802 square feet is available upstairs. Space can be divided if you need a little less space than this. Ground floor has 4,400 square feet available with bay doors. Two upstairs office with great windows and good parking. One office is 597.02 square feet and the other corner office is 1,277.6 square feet. Call 250-562-Rent. High profile location on the corner of 22nd and Nicholson. Location has 7 bay doors at grade level. There is 8,408.73 square feet of clean well lit bay area with 16' ceilings. There is also 5,941.57 square feet of office/classroom space at the front. Area can be divided. Property has lots of parking as well as a fenced yard. Call 250-562-Rent to view.